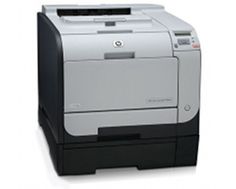 The HP Color LaserJet CP2025x is a standard, mid-range laser printing solution designed for low-to-mid volume use. Reasonable print speeds in both black and white and color, combined with paper input capabilities and a decent duty cycle, make this unit a workhorse that can perform under some of the most rigorous small business and home office demands at an acceptable price. Additional standard features provide versatility and convenience. The print speed of the HP Color LaserJet CP2025x is the same for both black and white and color printing at 21 pages per minute. The print resolution is also the same for black and white and color printing, at up to 600 x 600 dots per inch. Software drivers and tools can configure printing for automatic duplex mode, allowing for printing on both sides of a sheet of paper. The HP Color LaserJet CP2025x can accommodate various media sizes and types that can be fitted into three different media trays that support both custom and standard sizes of paper, and can accommodate a maximum paper weight of up to 47 pounds for plain paper and up to 58 pounds for laser glossy photo paper. Two 250-sheet paper input trays will accommodate a full ream of printer paper. Connectivity options include a high-speed USB port for direct PC connection and a built-in fast Ethernet 10/100Base-TX adapter for network utilization, via the TCP/IP protocol, allowing for small or large network access without the need to connect the printer to a central server. This unit is fully compatible with a wide range of operating systems, including Windows 7, 64-bit Windows Vista and Mac OS X, and comes bundled with software and drivers that make installation easy and effortless through step-by-step wizards. Only 6.7 Watts of power are required for sleep mode and 18 Watts for standby/ready. The standard 128 MB of RAM memory is upgradeable to 384 MB with addition of a 256 MB RAM module to a built-in expansion slot. The 21 pages per minute print speed is significantly lower than other, comparable models from other manufacturers that can produce at a top speed of 35 pages per minute and at slightly better quality. Long warm-up and pre-printing maintenance times extend the total time until first black and white page output to 17.2 seconds and the first color page to 17.7 seconds, which is considered a long time to wait for single-page printing jobs. The monthly duty cycle is rated at 40,000 pages per month, in the median output range, but the manufacturer recommends limiting print volume to 750 to 2000 pages per month, citing possible print quality issues and equipment life reduction if this recommended quota is exceeded. A large dimensional footprint and weight make this unit impractical for personal home use. The unit requires solid, permanent table or desk space. The output tray holds a maximum of 150 sheets, which only allows for continuous printing for approximately 7 minutes before the tray is overloaded, making larger volume, continuous print jobs extremely impractical with this model. Power consumption is at a whopping 445 Watts when fully operational, which is more that most industrial grade multifunction printers and copiers use. Depending on frequency of operation, this high rate of power consumption can make the Energy Star compliance that is earned for low-power sleep and standby modes irrelevant. Even though this is a larger, more robust unit that many people consider to be a workhorse, toner cartridge yields are incredibly low. Review it: "HP Color LaserJet CP2025x "
The HP Color LaserJet CP2025x comes with one black starter toner cartridge with a full yield capacity of 3,500 pages and three color starter cartridges (cyan, magenta and yellow) with a full capacity yield of only 2,800 pages. 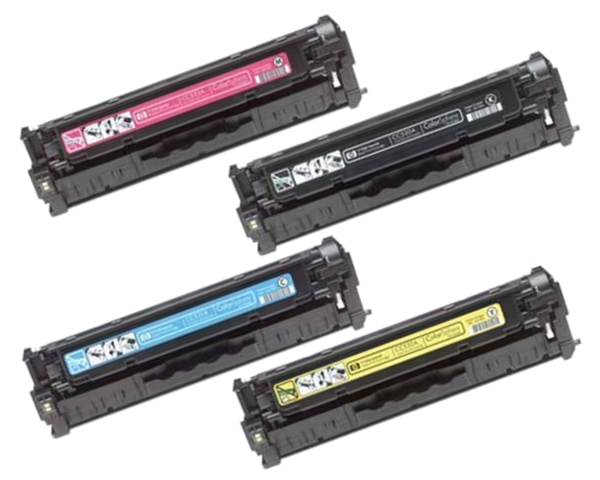 Replacement cartridges come with the same maximum yields, which are approximately half of the maximum yield of toner cartridges that are used in other, comparable models. 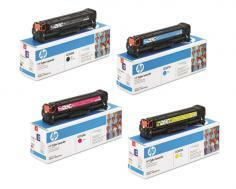 Even non-OEM replacements are slightly higher priced than others and do not warrant the elevated cost per page.